The sense of relief as we parked up at the Torridon Hotel and Inn after a two-and-a-half-hour drive from Inverness Airport was palpable. It was November and though the drive should have taken a lot less, a delayed flight and early sunset meant we had to navigate a large part of the route along a single track road in the dark. And then it started to rain. Nevertheless, we had made it and walking into the lobby of the hotel, where a stag head stared down at us to the left and a fire crackled away to our right, felt a lot like we had returned from a major expedition. What that imagined expedition was we didn’t know but we felt like victors and fully deserving of our feast to come. Checked in and warmed through, my friend and I virtually skipped to our bedroom to prepare for dinner. From our double windows at the front of the Victorian manor house we could just make out the silhouette of some large mountains looming over the black loch, but the view would have to wait, hunger beckoned. Downstairs in the 1887 restaurant we could hardly contain our excitement. Weather like this called for two things: red wine and food. And lots of it. I opted for the lamb belly with anchovy, spring onion, carney ash and pickled white cabbage to start, while my friend chose local Wester Ross salmon with sea buckthorn, sea vegetables, and grilled lettuce. For main, I couldn’t resist the halibut with leek, Skye mussels, cured ham and butter milk, while my friend decided to try venison for the first time, reared on one of the mountain ranges we couldn’t quite make out: Beinn Eighe. It was all rounded off with a delicate gingerbread (for her) and a selection of British cheeses for me. Full-bellied, rosy-cheeked from the wine, but not quite ready for bed, we made our way to the Whisky Bar where we sat next to two couples (one English, one Scottish), who seemed to find our dallying over the menu quite entertaining. “Where are you off to tomorrow?” the Scottish husband asked. “I’m not sure,” I said. “Perhaps we’ll just explore the estate.” Truth be told, we hadn’t actually thought past dinner. “Are you driving?” he asked. He must have seen the hesitation in my face. The last thing I was thinking of right now was getting behind the wheel of a car. “You have to go to Diabaig” he instructed. “What’s the drive like?” I asked. He could hardly hide his amusement. “Oh fine”, he said. “You’ll be fine.” All the while glinting at me. My stomach did a backflip. My friend just laughed. Brushing off the sense of impending doom I returned my attention to the menu. 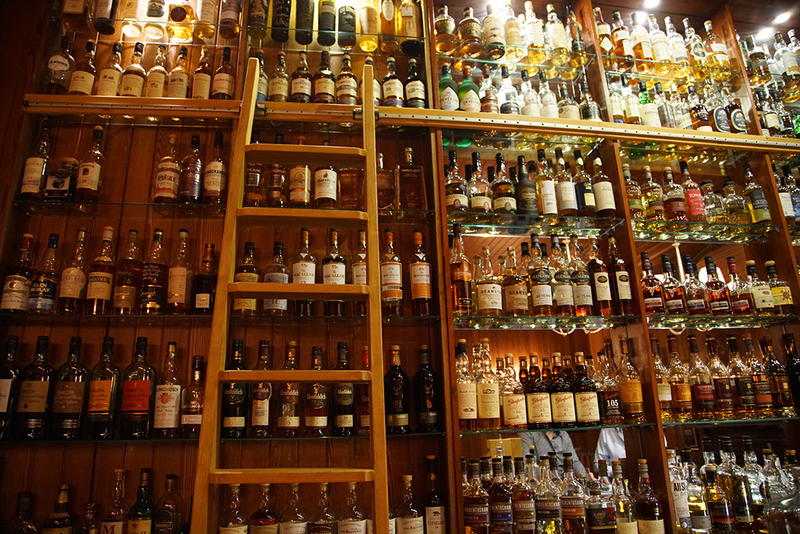 With 350 malt whiskies to choose from, it can be a daunting prospect choosing a nightcap at the Torridon. Luckily for us, the helpful barman was on hand to help steer our decision. “I like it a bit peaty but not too smokey” was my pathetically inept instruction. However, somehow it worked and I was presented with a dram of my new favourite whisky brand: Bunnahabhain. It wasn’t quite as nice as the Old Fashioned cocktail the barman subsequently made me, which I declared to the whole bar (well by this stage it was just me, my friend and him) was the “nicest Old-Fashioned I’ve ever had”. Needless to say, we slept very well that evening.